Dianne Adler, a friend of Della�s from back home, has the face of an angel and a figure that was voted the best in the Smoky Mountains. Dianne has come to L.A. to work a modeling job that actually calls for her to gain weight. Now why would someone pay her $200 a week for two years to risk ruining her figure? Dianne says that Harrison Boring hired her to model a new line of clothes made for women just a little overweight. When Perry sees a clause in Dianne�s contract calling for her to split 50-50 with Boring any money she earns over $200 a week, he gets curious. But, when Boring is killed, it�s only the beginning of Perry�s troubles�. Uncredited Actors: Don appears today in court. Submitted by BigBill767, 6/17/2016. Sightings: We see the Distinguished Gentleman three times today. He is having lunch near Della and Diane and is then seen walking outside the restaurant as they leave. He has become a businessman as he runs the Taco & Hamburger stand on the beach. Quiet Old Man #1 attends court in the back row behind Perry. Submitted by BigBill767, 6/17/2016. Location: In an early sequence, Della makes a call from a phone booth on Wilshire Boulevard across from Palisades Park in Santa Monica. The following pier scene is at Santa Monica Pier. Submitted by Mitch English, 4/2/2005. + The restaurant appears to be the Belle-Vue. Look for the Surf View Cafe on the pier. Later, there�s a glimpse of the Breaker�s Motel sign. See more here. + Also, Paul Drake can be seen standing by the Surf View Cafe on the pier. The 880 address is clearly visible. The Surf View is still in business and still at 880 on the Santa Monica Pier. Later in that same scene as Perry stands by the scales, over his shoulder you can see a sign for a shooting gallery. That too is still in existence just a few feet away inside the Arcade. Posted by Eric Cooper, 8/7/2009. See more here. +In this episode, Della reveals that her original home was in the Smokey Mountains region. Submitted by PaulDrake 33. 1/15/15. 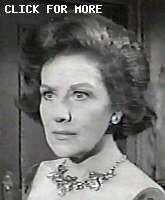 Ruth Warrick makes her only Perry appearance here playing Mrs. Winlow. Ruth Warrick�s first movie role was as Orson Welles� first wife, Emily Kane in the classic movie Citizen Kane. However, most people will remember her as Phoebe Taylor, the matriarch of All My Children for 35 years until her death at age 89 in January 2005, Submitted by PaulDrake 33, 26 August 2009. Character Names: Mr. Winlock�s first name is George. We never learn Mrs. Winlock�s first name. Submitted by gracenote, 4/16/2011. Ray Collins (Lt. Tragg) appears in the credits only. Submitted by gracenote, 4/16/2011. Continuity: When Perry and Paul enter the elevator, the light inside the elevator changes between the distant shot and the close-up shot before the door closes. Submitted by Alan Smithee, 12/30/2013. Go Daddy Go: That swingin' tune we hear, when the too-cool-for-school stepson opens the front door for Perry, was also played in the night club in TCOT A Place Called Midnight. That band gets around. JohnK, 4 February 2018. Poor Della Street shouldn�t be so hard on herself. She�s beautiful! But I think all the female readers of this wiki can relate to the feelings of inadequacy that models provoke. Submitted by gracenote, 4/16/2011. Hollywood seems to have funny ideas about weight and eating. If the young lady kept eating as she did at lunch, she would gain 12 times 12 pounds. She must have consumed 1000 calories at lunch alone, not to mention the half-dozen candy bars for a snack on the beach, followed by an ice-cream cone. (Additionally, the cottage cheese that Della was dieting on is actually quite fattening.) Submitted by gracenote, 4/16/2011. PM shows, of course, have cast many former beauty contestants (Miss This or That; Mary Ann Mobley was Miss America 1959), but director Arthur Meeks took especial care here to slowly pan up Diana�s legs, thighs, stomach and chest as she lies on the beach. Really unnecessary emphasis of her body, but the shot has been appreciated for many years. Submitted by cgraul 11/21/2011. + I wonder where those extra 10 pounds that Diana had put on were located. Perhaps she left them with her lawyer to carry around for her? chuckled by TerryS, 4/5/2019. Normally, the attorney court objections in PM episodes are legally sound, even if not appropriately raised. In this case, Perry crosses a witness as to physical layout, and Hamilton objects that he already covered that material, and the objection was sustained. In fact, the cross-examining attorney has every right to re-question on every item covered in direct examination. Submitted by cgraul, 11/21/2011. For the second time in five episodes, Paul's cover is blown by his car. In TCOT Reckless Rockhound, it was the license plate; in this episode it's the registration mounted to the steering wheel. As I've stated previously, it's amazing to me that at one time people were required to display their registration in their vehicle for anyone to see. Today it would be considered an unacceptable invasion of privacy. Submitted by 65tosspowertrap, 12/30/2013. In the episode, the murderer, the private detective, is NOT an employee of Paul Drake. But in the book, he IS Paul's operative. In fact, in the book, Perry had previously represented him. So, in the book, the P.I. works for Paul, who works for Perry. Thus, indirectly, it is Perry's own employee who is the killer! Submitted by Bill-W2XOY on 08/26/13.